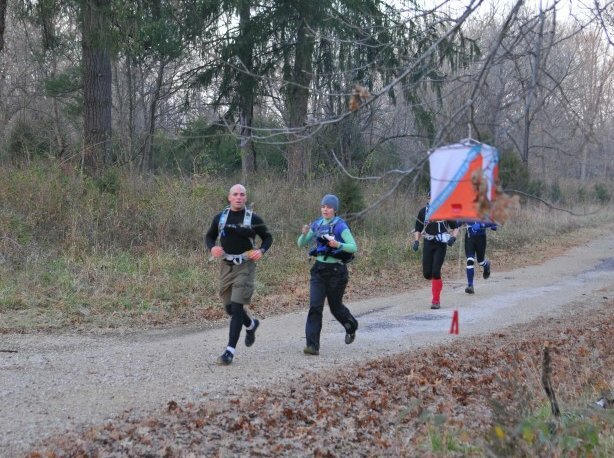 In honor of this weekend's Bonk Hard Castlewood 8hr AR, I've dug up my race report from 2010! At the time it was the most successful AR I'd competed in. Here's a little taste of the 2010 course and can't wait to learn about the 2012 race, where I am teamed up with 3 AR newbies from my mountain bike team. Stoked! Bill, Rob, Mike and I met up at Alpine Shop on Friday after work to check into the race and check out the awesome deals. We received really nice 30% off coupons in the race packet so everyone bought something, the guys each got Osprey packs and I was the black sheep and only bought glove liners to replace the ones I tore at Rockwoods. Our pre-plotted maps were three 8.5x11s with an aerial photo, an o-map, and a zoomed-out USGS, and one 11x17 o-map. Back we went to Bill’s house for some route planning and bike packing strategizing since we would have to paddle with bikes. We left Bill’s pretty early for an AR-eve, around 8pm. Saturday morning starts about 4.30am with a bike drop at Sherman Beach. I time my arrival perfectly and meet Bill and Rob as they are almost ready to leave so they can show me where to put the two bikes I have (mine and Mike’s). The beach is muddy but fortunately Bill and Rob have staked out a great spot right next to the access trail, and we are able to leave before the majority of racers arrive. The team then rendezvouses at Castlewood where the busses pick up all 200-some racers at 6am and drive us to Route 66 State Park for the start. The traditional pre-race bladder emptying ceremony begins immediately after the busses park and everyone bounces around trying to stay warm before the start. Then we sing the national anthem, wish our friends good luck and our teammates better luck, and tighten pack straps until the horn blows and the race is on! We know the first trek will be an all-out footrace since the terrain is flat and relatively open, and we are in the company of some terrific navigators. On Friday the team had chosen a clockwise route around the CPs and we soon find out that Bushwhacker, Alpine Shop, and Czech-N-Go have chosen the same. The four teams stick very closely together as we punch CP5 and CP3. CP4 throws the first curve ball as there is a fence to either climb or run around on the approach - Mike and I choose to run around, grab the punch, and the Bill and Rob yell for us to climb over the fence on the return. Mike boosts me over the fence and I very ungracefully tumble over into Rob’s arms, but we jump back on the road to CP2 at a great pace. Alpine Shop catches back up at CP2 but we manage to push the pace through CP1 to narrowly lead the pack into the put-in. Our celebration is short-lived, however, as all three teams manage to blow past us in transition and we start paddling about a minute behind. Taking myself off of Mike's tow as we approach a CP in Route 66 State Park. The paddle begins with a small bit of excitement as we pass under the I-44 bridge. There is a submerged log creating a bit of turbulence that sends our boat skidding sideways. Thankfully we avoid dumping and it’s actually a fun way to start the paddle. We try to stay on the heels of Bushwhacker, Alpine Shop, and Czech-n-Go, and on the first long straight-away, we catch sight of 2 boats wayyyyy out in front, so far away, in fact, that we assume them to be volunteers taking the long way to their assigned checkpoint, and consider ourselves to be in 4th place overall. About ⅔ of the way downriver, another 2-person male team passes us, but we hold onto (what we believe to be) 5th until the take-out at Sherman Beach, site of this morning’s bike drop. Transitioning from paddle to bike with Bushwhacker hot on our heels. At the take-out, we quickly punch, grab our bikes and high-tail it to the parking lot to avoid mud while we transition into bike shoes. Soon enough we are onto the flat, dirtpack trails of west Castlewood on our way to CP8. When we arrive, there are a bunch of very confused adventure racers milling about the trail intersection with unhappy looks on their faces. Turns out CP8 is nowhere to be found compared to its plotted location on the map. Everyone nervously dashes around, looking for the elusive punch, and after about 3 minutes of indecision we all decide to move on and protest to Jason later. It’s a bit risky to knowingly skip a CP, but when 3 of the top AR navigators in the country are confused, you know that something is wrong on the map so we take our fate into our own hands and proceed. CP9 is punched easily enough, and we CP10 which requires a bike drop and a short run through a concrete tunnel to the punch. The team sends me alone with the passport through the tunnel, and on the other side I discover our favorite volunteer and sometimes-teammate Mike Cooper, who demands to see all four of our shining faces before he allows the punch. Since we have arrived with several teams (and each only sent the passport holder through the tunnel) there is a bit of confusion as teammates scramble to communicate this requirement and assemble directly in front of the checkpoint. We manage quickly enough and are soon back on the trail to return to the canoe take-out. Here, we have to load the bikes into the boats for the remaining paddling legs. Our system requires removal of everyone’s front wheel and then we ratchet the frames vertically into the boat. It’s a little tedious, but very stable and pretty soon we are into the water for a micro-paddle to 13 and 14, the next take-out. CP13 is located on a slough just after we put-in. From the maps, it is unclear if the water is navigable on the south side of the island, so we play monkey-see-monkey-do when the teams ahead of us beach their boats on the island and run to the other side. After we get out and look at the slough, we discover it is indeed navigable and we can choose to either across its waist-deep waters or return to the boats and paddle to CP13. We choose the latter because no one is brave enough to go swimming on this 30-degree day. Back into the boats we go, navigate through a tricky log jam, grab CP13, and continue on the river to CP14, the take-out at West Tyson. We arrive at CP14 shortly after Bushwhacker and shortly before Alpine Shop. This is an excellent place to be and I am thrilled we are still in the mix mid-race. This trekking leg has six checkpoints, ROGAINE-style, and we choose clockwise. Bushwhacker chooses opposite and soon it is us and Alpine Shop negotiating our way across the flats. I try to eat a peanut-butter cracker, but flies out of my mouth and we leave it behind without a thought since I have 5 more left in the package. Before we hit the hills, we cross a tall-grass prairie, where I get flashbacks of the Thunder Rolls Radio-O and pretend to be a bison. Snorting not included. Soon we are picking our way up a long, rocky reentrant towards CP17 with a 2-person male team and Alpine Shop close behind. We grab the punch and look at the route to the next control. Wow. There are a lot of contour lines to cross. And they are awfully close together. As the terrain gets steeper I start to improvise some bear-crawl moves to give different muscles a rest and it works well on the most challenging uphill sections. We grab the trail around to CP14’s attackpoint, descend into a nice creek bottom and follow that to CP20, where we pass Bushwhacker flying along, the opposite way. They are so fast! CP20 has volunteers, heated bathrooms (such luxury!) that we don’t use, and a gear check. Everyone has everything, so we are off again to CP18 with Alpine Shop still on our heels. On our way up the spur Mike gives an inspirational speech (of course only Geiger could summon enough breath to talk on the uphill) and we motor along for the punch, the inevitable steep descent, and following steeper climb. Here is where we make our biggest nav error on the day: at the top of the ridge, there is an unexpected trail and we complacently hop on and follow...straight into the power cut, private property, and the extent of the mapped area. Time for a 180 and retracing of steps. Never fun thing to do and even less fun at the moment because it means Alpine Shop has caught us and leads us into CP15. We descend furiously to regain the lead and push hard back to the beach to reunite with the canoes. On the way back we pass close by my dropped cracker location and I offer Rob $5 to find it and eat it. He does! In stride! Discounted entry fee for Mr. Wagnon! We return to the beach to find out 3 teams have already left. We know Bushwhacker is one of them and assume Czech-n-Go is out in front as well. But who is the third team? 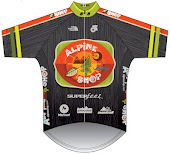 No clue, and no time to think about it because Alpine Shop is flying through their transition next to us. We hustle to get in the boats, still with our bikes loaded, and hit the water for the last paddle. The turbo-powered duo of Mike and Rob gradually gain on Bill and I, and both Alpine Shop boats gain on our team as we make our way towards Castlewood. I mention to Bill that we should beach our boats by the steps, carry a bike over to 23 and punch, and then get back in the boats and paddle to the take out and go straight to 24 (the superintendents house). The clue sheet does say 23-29 in any order but I think that would technically be precluded by the take-out at 22, so we decide to stay legal and head to the take-out. The last corner greets us with a full-on, freezing cold headwind that makes us glad to ditch the boats and hop on our bikes. Evidently Rob’s bike didn’t care for its aquatic journey as the rear wheel has untrued itself and hangs up on the rear brake. I unhook it (the brake, not the wheel) and inform him that his only has the front brakes to work with. Bill’s legs aren’t too happy with the boats either and are threatening to cramp at any minute. The take-out at Castlewood boat ramp, we are almost done! Thankfully we have a flat out-and-back section to CP23 so we cross our well-mittened fingers are hope Bill’s legs can survive a few more miles. Mike punches and we are on the way to CP24, which brings us up the superintendent’s driveway (hope he doesn’t mind) and a short hike up the hill to punch, thus avoiding both the stair and Lone Wolf climbs. Back on the park road and to the dirt crit track for CP26, which we blow by in our excitement and have to relocate, backtrack, and punch. Then we return to the pavement and go up Ries Road, turning into the woods just before the start of the really steep part. We ride for about 100m, ditch our bikes and begin to trek up to CP27. The other option here was to ride the singletrack up Cardiac Hill, but we figure in our current state we’d be pushing the bikes anyway and this route allows us to cut out some distance on the backside. After punching, we cut back down to our bikes, ride across Ries, and bike-whack up a short distance to Love. We hop on the bikes and Bill’s legs immediately start to complain and cramp up. Mike takes his and Bill’s bikes and runs with them down the trail to punch CP28. Rob and I slowly pedal to help a walking/jogging Bill as we make our way down Love, through a short, and thankfully last bike-whack up to a fire road to drop onto CP29 from above. After this, we know it’s all downhill to the finish so Bill remounts and we cruise down Grotpeter, punch CP25, and head to the finish! Mike waves to all of our fans as we finish the race! Just kidding Mike, we have no fans! At the finish line, we are greeted with cowbells, and we learn our official finish time is 5 hours and 54 minutes of racing, and three 4-person co-ed teams finished in front of us. 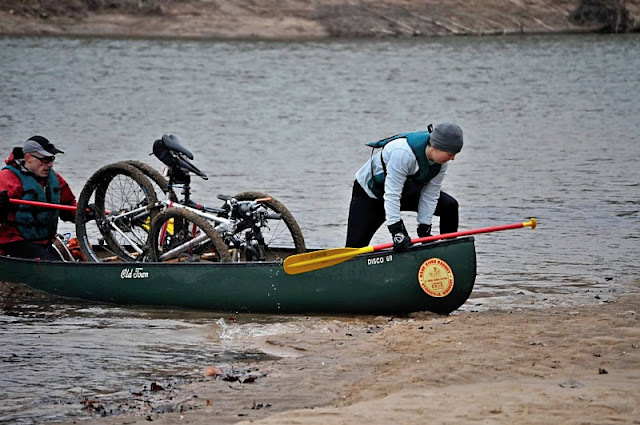 Turns out those boats we saw on the first paddle were not volunteers, but in fact the leading/winning team, Ridgerunner Sports/Downhill Bikes Branson. Alpine Shop edged out Bushwhacker on the final bike and we are in fourth. However, the race director is out on the course inspecting the location of CP8 so our fate is not certain because we skipped this apparently misplaced checkpoint. While waiting for him, we compare route choices with other navigators, huddle by the fire, and eat delicious racer-made cookies. Eventually we learn that CP8 was indeed mis-hung and will be thrown out of the race. This makes our fourth place finish (6th overall) all but final and we are able to celebrate one of the best races I have ever participated in! Finish line! In warm clothes!